First things first, if you have left arm pain, chest pain, and a shortness of breath, call 911 and get to a hospital. This is an emergency situation. Stop reading here and seek care. If you don’t have those symptoms, then keep reading. My shoulder still hurts, and its has hurt for a while… it doesn’t seem to be going away! There is a significant possibility you’ve injured your brachial plexus. The brachial plexus is a group of 5 nerves (C5-T1) that leave the spine, joint together and split apart multiple times, resulting in several nerves that give your arm the ability to move and feel. 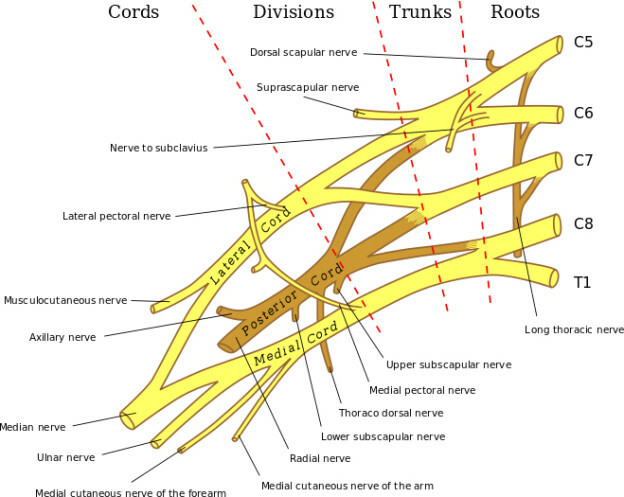 Sixteen (16) total nerves comprise the brachial plexus. There are numerous ways the nerves may become damaged. Each of these nerves passes through some pretty dense muscle, for protective reasons. (as animals, we commonly get hurt doing things, and if any of these nerves is damaged significantly enough, you’ll lose complete function of some part of your arm. That is pretty important in terms of survival.) Between the dense muscles and the nerves lies a layer of slippery tissue known as fascia. If the muscle becomes irritated from overuse, the fascia will become inflamed simply for the fact that it is in the immediate area. The overused muscle won’t contract and relax as well as it should, the fascia won’t slide as well as it should, and the nerve will get caught in the anatomic traffic jam that is forming. If everything starts to become rigid and inflexible, the nerve will start to become irritated as the inflammation spreads form a localized problem to a larger regional problem. The most common cause of these types of injuries is poor shoulder movement, typically seen with poor posture. I’ve written about this a couple times before. However, these types of injuries may also be seen post chest surgery. Mastectomies, lumpectomies, open heart surgeries, or augmentation surgeries are major culprits of producing scar tissue and massive amounts of inflammation in the chest region, which may cause problems with the brachial plexus. Why does surgery cause this? Breast augmentation quite commonly has this as a sequela, simply due to the one of the methods of implanting a prosthetic is to implant it under the pectoralis major muscle. This obviously causes a tightening of the pectoralis muscle, and alters rib/shoulder movement. Given the image posted above, the pectoralis minor will be carrying extra strain and quite possibly be scarred during recovery. Without proper movement, inflammatory chemicals will continually be released by this tissue, as it expects to contract/relax easily. As with the lower attachment of the anterior and middle scalene, also shown above, they attach to the first and second ribs, respectively. If any of these 3 muscles become to “tight” or restricted, they will produce inflammatory chemicals and cause chemical irritation to the localized tissues. 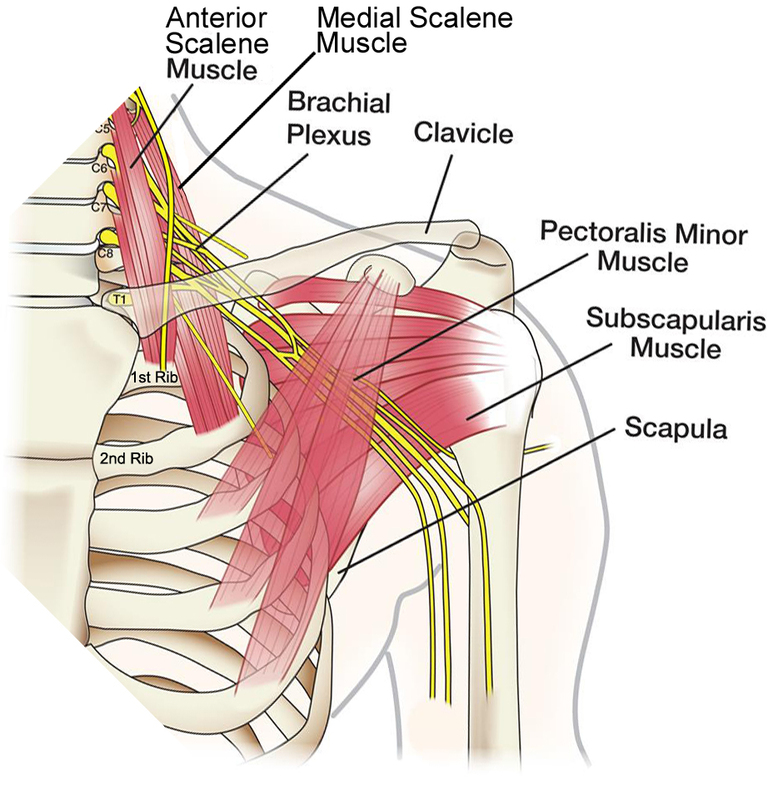 The brachial plexus just so happens to be in the area, which when irritated, may cause pain all the way down the arm. Ok, so how should I get this treated? Avoiding surgery would be ideal. However, that isn’t always possible. I’m not here to contest surgery. If it’s necessary, it’s necessary. If you DO need surgery, be sure to get excellent rehab afterwards. If rehab doesn’t go well, or you’re in too much pain to effectively complete rehab, then an office similar to mine will be the other option. I handle patients similar like this on a very regular basis. They are by far my most common group of patients. The muscles need to have the scar tissue “broken” and the muscle needs to heal effectively back to how it was originally. This requires manual therapy to break the scar tissue, and proper movement protocols to ensure you’re maintaining a painless ROM. My protocols work excellent for patients who experience pain or dysfunction in the arm, where physical therapy cannot be completed due to pain, or patients who feel like they need surgery, but want to try all other options first. Most times, the pain starts at the neck and involves many locations below that. I offer comprehensive examinations to be sure we’re targeting the proper structures as treatment progresses. I also have excellent referrals to quality physical therapists, personal trainers, and massage therapists if after the pain is reduced, you want more specifically targeted care to return to your best health. If surgery is required, I will be sure to get you in touch with excellent surgeons to ensure you get the best care possible. Don’t ignore pain. The quicker you get the care you need, the less care you’ll need! Get a Professional Evaluation on Your Shoulder!